Today's post is something a little bit different for me. I don't venture much into nail vinyls as usually I don't get on with them but when Alex from Nail-Artisan asked me if I would like to try some RockNailStar Vinyls I thought I'd give them a go. The first pack I tried was Heraldry. There is a mixture of single images and then the full size ones. Unlike other nail vinyls I have tried, these peeled really easy from the backing paper. My base colour is Ocean Song from Moo Moo Signatures. I applied a fast dry top coat and then applied the nail vinyls once it has dried fully. 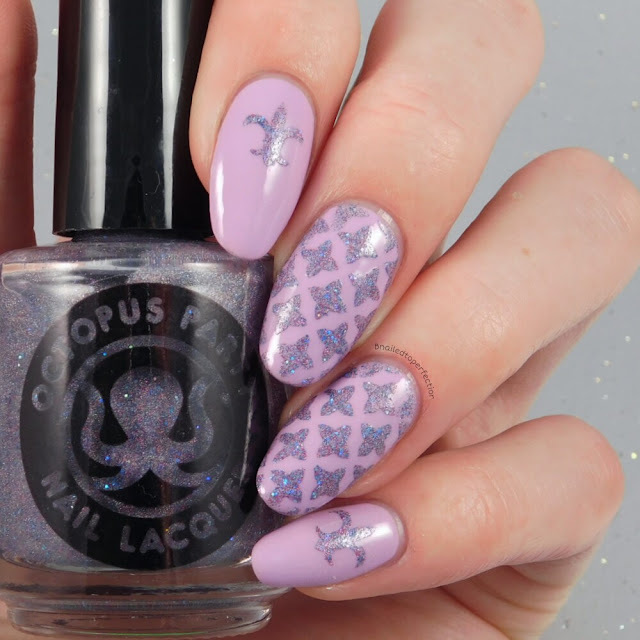 To apply Crepuscular from Octopus Party Nail Lacquer I used a sponge. When it came to peeling off the vinyls, they came off like a dream and no bleeding of the polish either! I was really impressed with RockNailStar vinyls and the best part is, this design is only £1.95!! That's great value in my opinion. Check out Nail-Artisan for RockNailStar vinyls and other great items. What do you think of this design? Do you like nail vinyls?